It’s finally here, Day 1 of the Stanley Cup playoffs! Not to sound like an old fart, but don’t you miss the days when the first round would have 4 series on one night and then the other 4 series the next night? The only thing better than 3 playoff games to watch tonight would be having 4. Anyway, there are 3 series starting tonight, and they all look interesting. The Lightning tries to overcome a pile of late-season injuries while the Red Wings hope to make one final Cup run with Datsyuk; the Rangers and Penguins battle in a matchup of banged-up former Patrick Division rivals; and the Blues take on the Blackhawks in a series that has 7 games written all over it. It’s unreal that one of those teams is guaranteed to be eliminated in Round 1. In case you missed it, we posted series picks for all 8 first-round matchups, complete with odds. Some of the odds have changed dramatically (like the Penguins, who opened -118 against the Rangers and were up to -160 this morning), but it’s still worth a read if you’re thinking about doing any series betting. Make sure you shop around for the best odds, because they vary greatly by sportsbook. 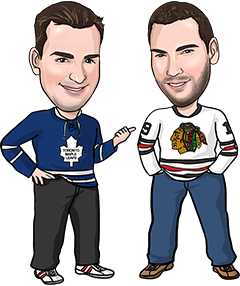 We also put up a post about the latest Stanley Cup betting odds and listing where you can get the best odds for each team. That page was updated this morning. If you’re new to online hockey betting, now’s a great time to get started. You can get a $200 bonus on your first deposit at Bet365 and Bodog, and Americans can get a $250 bonus at Bovada. Canadians can grab a free $125 when they sign up at Sports Interaction! The bonuses alone should give you plenty of money to bet with for the next 2 months. We’re going to dip our toe in the playoff waters with just 1 pick for tonight. So much of playoff betting is about situations and momentum, so we don’t like to get too involved until at least 1 game has been played in a series, but we do like one bet tonight. Good luck with whatever bets you make, and enjoy the action! There’d been a lot of uncertainty about the Penguins goaltending situation the past couple of days, and it seemed possible that Jeff Zatkoff might be getting the call for Game 1. But it looks like Fleury will return to the Pittsburgh net, which actually makes us like the Over a bit more. If Zatkoff was playing in goal, the Penguins might have played a bit more defensive-minded, afraid to take many chances. But with Fleury in there, Pittsburgh’s mentality will likely get back to playing its regular game, and lately that’s meant offensive hockey. Prior to a 3-1 loss to the Flyers in the regular season finale when Pittsburgh sat its stars, their goal totals were 4, 5, 6, 5, 5, 5, 3 and 7 in their previous 8 games. The Penguins’ offence has keyed their strong finish to the year, and we hope that a few days off won’t cool them off. Fleury could also be a bit rusty, which obviously helps the Rangers attack. New York has played some higher-scoring games of its own lately, going Over or pushing the total in each of its last 12 games. Add in the fact that this is a series opener, when intensity might not be at its absolute highest, and we really like the chances of there being at least 5 goals tonight.